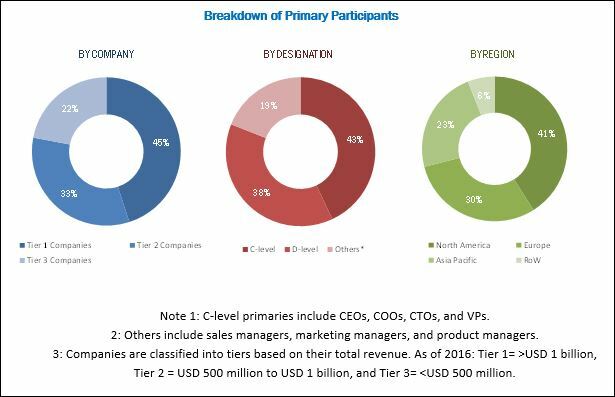 [273 Pages Report] The pharmaceutical excipients market was valued at USD 6.07 Billion in 2017 and is expected to reach USD 8.53 Billion by 2023, at a CAGR of 5.9% during the forecast period. The growing pharmaceutical market along with the advancements in functional excipients, growing generics market propelled by the patent cliffs, and the rapidly growing biopharmaceuticals sector are the major factors driving the growth of the market. Factors such as the emergence of multifunctional & co-processed excipients, shifting focus of pharmaceutical manufacturing to emerging markets, and the growing biologics and biosimilars industry also present significant opportunities for the growth of excipients. The major players in the pharmaceutical excipients market are Ashland (US), BASF (Germany), DowDuPont (US), Roquette (France), Evonik (Germany), Kerry Group (Ireland), Croda (UK), Associated British Foods (UK), Archer Daniels Midland (US), Lubrizol (US), Wacker Chemie (Germany), Innophos Holdings (US), and Signet (India). The global pharmaceutical excipients market is projected to reach USD 8.53 Billion by 2023 from USD 6.40 Billion in 2018, growing at a CAGR of 5.9%. Factors such as the growing demand for pharmaceuticals due to the rising aging population and the incidence of chronic diseases, advancements in functional excipient development, growing generics market due to patent cliffs, rapidly growing biopharmaceuticals sector, emergence of multifunctional & co-processed excipients, and the growing biosimilars industry are driving the market growth. The report analyzes the market by product, functionality, type of formulation, and region. Based on product, the organic chemical excipients segment accounted for the largest share of the market in 2017. This can be attributed to the use of these excipients in majorly all of the pharmaceutical formulations as they offer advantages such as increased efficacy in oral delivery of poorly soluble molecules along with increased compressibility and flowability properties. Based on functionality, the pharmaceutical excipients market is segmented into fillers & diluents, binders, suspending & viscosity agents, flavoring agents & sweeteners, coating agents, colorants, disintegrants, lubricants & glidants, preservatives, emulsifying agents, and other functionalities. The large share of the fillers and diluents segment can be attributed to the increased use of fillers and diluents in the development and production of solid oral drugs. They improve the taste of the formulation and provide ease of administration (of the drug), along with offering stability, ease in preparation, packaging, shipping, and dispensing of drugs. On the basis of type of formulation, the oral formulations segment dominated the market in 2017. The oral route of administration is the most common and traditional route for drug delivery. With the development of excipients to improve the functionality of active pharmaceutical ingredients (APIs) in tablets and capsules, the demand for these formulations is high. This in turn will also propel the market growth in the coming years. 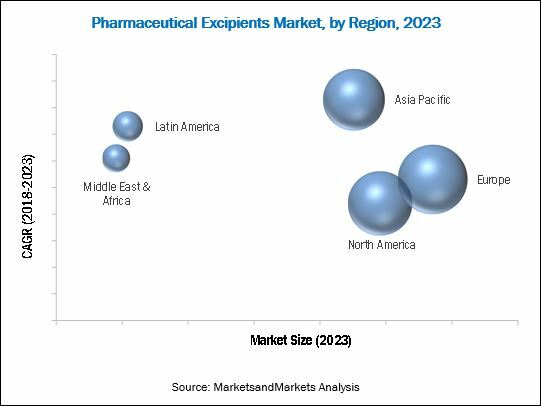 Geographically, the pharmaceutical excipients market is segmented into North America, Europe, Asia Pacific, Latin America, and the Middle East & Africa. In 2017, Europe accounted for the largest share of this market. However, the Asia Pacific region is expected to witness the highest CAGR during the forecast period of 2018 to 2023. The growth of this segment can be attributed to the low labor and manufacturing costs in China and India, cost-effective outsource manufacturing processes, increasing generic drug manufacturers, and less stringent regulations for pharmaceutical manufacturing. The global pharmaceutical excipients market is characterized by a large number of players. The market is highly fragmented and competitive in nature and is dominated by Ashland (US), BASF (Germany), DowDuPont (US), Roquette (France), Evonik (Germany), Associated British Foods (UK), Archer Daniels Midland Company (US), Lubrizol (US), Croda (UK), Innophous Holdings (US), Kerry Group (Ireland), WACKER CHEMIE (Germany), and Signet (India). Key players in the market are pursuing several organic and inorganic growth strategies such as product launches, expansions, acquisitions, and agreements to garner larger shares of the market. During 2014 to January 2018, companies adopted expansions as their major growth strategy followed by acquisitions.